The days have gotten slightly longer, the temperatures slightly higher, and the crazy amount of snow on the ground is melting a little bit. Yesterday I pulled out of the driveway that is dirt in the summer time and narrowly missed hitting the back of sweet husband’s truck with the front of our suburban as it slid around in the mud trying to back out. Of course I was sliding around so slowly I knew I’d clear his back bumper by the time my front bumper got over that far. I did not want to step out and sink in the mud to lock the hubs in for four wheel drive. This mud pit is an annual thing. Maybe we need a boatload of gravel or even better some cement or asphalt. 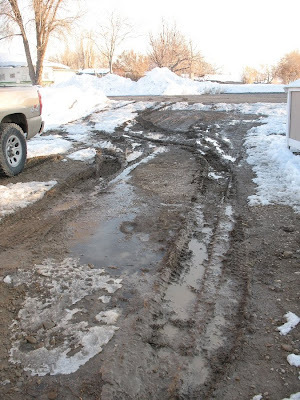 So for now I’ll be parking in front of our house where the snow hasn’t all melted and turned to mud yet so I can go pick the kids up from school without getting stuck or having to put the vehicle in 4 wheel drive. Mud. At least it’s a sign that spring will be coming sometime. Hopefully soon. Put a lot of brick or and rocks in there whilst it is mud. It will aventually settle down, and meanwhile you can get in and out. Hey, any sign of Spring is a good sign…right? Have to say though, that is a nasty looking mud hole! Gravel will eventually stabilize a spot like that but it can take a lot of it, depending on how absorbent the soil is.